Colorful foliage adds garden value! Unlike those of us who've caught the iris virus, the everyday gardener wants more out of their plants than a single season of bloom. Rebloomers can fill this need with additional flowers but for multiple seasons of interest and good structure in a mixed border interesting foliage is a necessity. 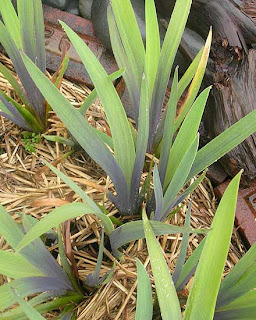 Gardeners have always appreciated the structure of the sword-like fans of leaves of a bearded iris, but many do not know that iris foliage can provide dramatic color as well. Here are just a few of the varieties I grow that are pretty in almost any season. 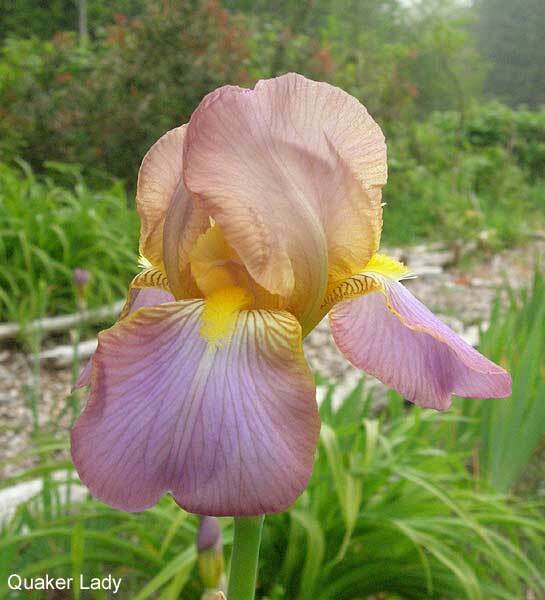 First up is bearded iris 'Argentea' (Goos & Koenemann, 1906). A form of I. pallida but featuring very bold white stripes up the leaf blades. The flower is the same classic pallida bloom with the heavy grape scent but the added interest of the foliage keeps this an attraction all thru the growing season. 'Zebra' is a similar variety but with bright golden yellow stripes instead of white. A more modern variety with lovely foliage is the Miniature Tall Bearded 'Madam President' (Thurman, 1998), each spring it has started off with lovely light bright yellow-green foliage which persists until summer heat and sun sends it darkening to a normal tone. It glows in even the lowest light. Another iris with excellent coloration is the species cross 'Gerald Darby' (Coe for Darby, 1967). The early spring foliage has some of the darkest purple-based foliage (PBF) of any iris I've seen. The color show continues as the deep purple, almost black, bloom stalks rise up and bear lovely violet-blue flowers, followed by seed pods that float like green balloons over the foliage thru the summer. Later leaves are less intensely colored but are still lovely. 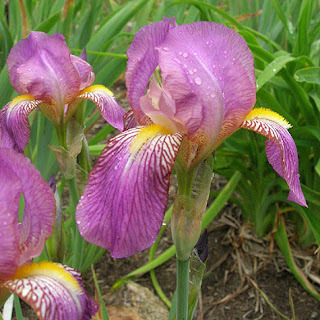 Many other species of iris are known to have varigated variants as well. 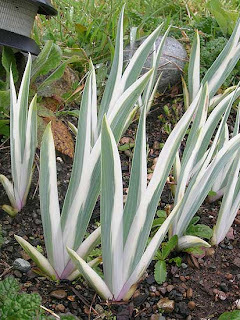 I've seen versions of I. pseudacorus, I. foetidissima, I. ensata, and I. japonica with lovely white or yellow striped foliage, and have seen the glowing yellow-green effect on a few siberians. PBF, of course, is very common in the bearded group and some cultivars show it heavily - often even extending to the spathes when in bud. 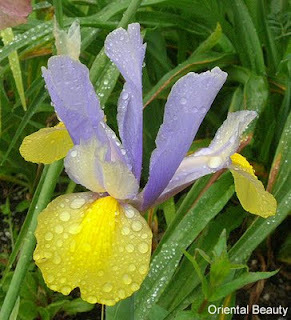 I've enjoyed following Thomas Silver's posts on Iris-Photos about his progress breeding for PBF, purple leaf margins and purple bracts. I think his work will bring us many beautiful plants worthy of our gardens in the future. So the next time one of your gardening friends dismisses the iris for its single season of interest, remind them that this great genus' colorful and structural foliage can bring so much more to the garden than a fleeting fabulous flower. With the help of the other members of the San Fernando Valley Iris Society and my sister-in-law Nora, I had managed to stage my first ever iris arrangements in the Artistic Division in record time. After the rush of the morning, Nora and I went to look at the other entries to catch our collective breath. Fat chance: the other arrangements took our breath away again. There were exquisite oriental arrangements, clever uses of rock and driftwood, unexpected uses of found objects. And of course, beautiful irises. If you have never been, you really must go to the next Iris Show in your area and take a look at the beautiful arrangements. Before the show, each member of the society is sent a Schedule announcing the theme of the show, the dates, the show committee members, and most importantly, the rules for exhibitors. This Schedule should be read carefully and completely if one wishes to avoid embarrassing gaffes, such as raising your fist and shouting out "Woo Hoo!" when you spy a blue ribbon beside your entry. I learned that this is considered bad form, and may even get you disqualified if heard by the judges. Exhibitors should avoid going near the area while the judges are considering the arrangements. It says so right in the Schedule [ahem]. 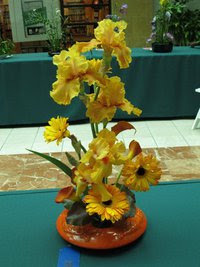 The judges have extensive experience with irises and undergo training under the auspices of the American Iris Society. They follow the rules as set forth in the Handbook for Judges and Show Officials, 7th Ed. They examine each element of an arrangement and discuss the merits among themselves, then compare the arrangements. There are different levels of awards distributed, so the judging process takes some time. After the judging is completed, the final awards are laid out next to the arrangements. Only then is it permissible to move in for your photo ops. When I returned on Sunday evening to collect my cake pan, I was stunned to see that the Industrial Revolution with Lady Friend had won not only a blue ribbon, but a second award for Best in Section! The Dark Ages had won a blue ribbon as well! I stood there in disbelief. But I was jerked out of my stupor when I watched my blue ribbons being swept up by Steve, a show official. What was he doing with my ribbons? As it turns out, the ribbons and trophies are collected at the end of the SFVIS Show to be given out at the annual awards banquet in June. My new friend Steve calmed me down, assuring me I would get them back. Whew. Thanks to this experience, I have a new art to practice, new friends who are talented people as well as kind and patient mentors, and a new appreciation for the beauty of irises. If you have never entered this competition, I heartily suggest you consider it next year. Take it from a novice: You’ll have a world of fun in the world of irises. The knowledge I gained from the AIS Artistic Design Tutorial allowed me to create two respectable arrangements for entry into the San Fernando Valley Iris Society's Spring Show, entitled "Irises Through the Ages." On the morning of the show, I asked my sister-in-law Nora to go with me, as my chosen Second. You know, the person who carries you off after you have been shot in a duel? It was 11 am. Plenty of time to load up the car and get over to the mall, about 20 minutes away, set up the arrangements by 12:30, take a few photos, and get home for a late lunch at 1:30. I had Nora to hold the arrangement. Oh-oh. Two arrangements. We scavenged around for a box of appropriate size, but could only find one that was unopened. It held a Rival™ Ice Cream Maker purchased as a gift for an upcoming wedding. We opened the newlyweds' present and crammed kitchen towels around The Dark Ages to hold it steady in the box, and managed to secure the whole thing with the rear seat-belt. The Industrial Revolution was a bit more of a challenge. Nora climbed into the passenger seat, and I gingerly handed her the ice-cream bucket (I guess we’ll be shopping for a new wedding present) half-filled with water, teeter tottering Lady Friend stalks, and dead stick with perfect little dead leaves sticking out of the top. While paying too much attention to sloshing water, and not enough to fragile irises, SNAP went the top bud, the bud that would be at the peak of the arrangement, the bud that the tutorial assured me would give the arrangement "balance." The time on the clock? 11:32. We made it to the Westfield Plaza without further incident, and at last Lady Luck seemed to be on our side. Until we found that the show was held at the Westfield Promenade, two blocks and countless speed bumps to the south. Ignoring the sloshing water and my bouncing Second, I screeched to a halt at the south entrance of the Westfield Promenade. It was 12:05. I grabbed the Rival™ Ice Cream Maker box with The Dark Ages out of the back seat, leaving my trusty Second stuck in the passenger's seat with wet pants and Lady Friend. I ran down the aisle, was directed down the escalator, and I threw the arrangement on the table where a little tag had my name on it. Jan Lauritzen, my arranging mentor and the Artistic Chair, glanced at her watch and said "you have seven minutes." I sprinted back to liberate my Second, who, along with Lady Friend, had begun to wilt in the 110 degree heat of the dark truck. We made it to the arrangement tables and I threw the Industrial Revolution together sans top bud with three minutes to spare. As I exhaled a sigh of relief and Nora went to stash our supplies, Jan turned around and asked "have you filled out your cards and your paperwork?" It was 12:28. To the rescue came three members of the Society, Jan, Lois and Debbie, who helped me fill out the cards and forms and get back down to the table, just as the clock hit 12:30. I had entered my first iris show. Piece of cake. Most of us love to have flowers in the house. 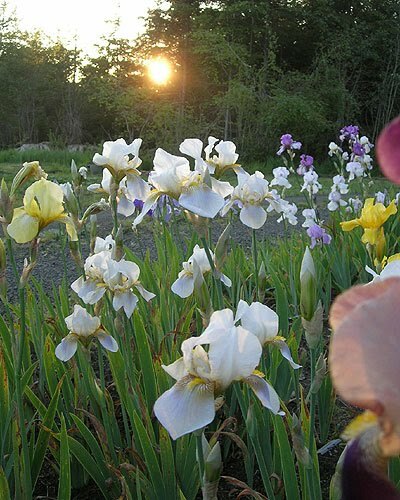 Especially irises, since many have a wonderful scent to accompany their beautiful shape and rainbow of colors. Normally, I cut bouquets, choose a vase that doesn't clash, and that's about it. Then one day last month I saw a lovely iris arrangement on the San Fernando Valley Iris Society Facebook Page, with an entry encouraging members to enter the Artistic Design Division at the Spring Show in April. Eventually, the desire to learn something about flower arranging overcame my fear of public humiliation, and I decided to enter. The Industrial Revolution class appealed especially, if only because my house and yard are littered with recycled and industrial materials. It seemed a natural fit. Or, I could even get some new junk. My brother brought me three pieces of steel pipe. My husband warmed to the idea of flower arranging when he saw the pipe, and suggested that I use dry ice (steam! he exclaimed) and an Erector Set motor to spin the irises. Maybe sprinkle a dead iris stalk with coal dust? he asked, helpfully. Do they even still make Erector Sets? And where would I get coal dust? While he sulked, I wondered… China is industrializing…. How about a "Made in China" theme? My friend Walter even pointed out the beauty of this plan: I could go buy everything I needed at Wal-Mart. Hmmm… perhaps too subtle. Thank goodness, the American Iris Society website has an invaluable resource: an iris arranging Design Tutorial by Jean E. Morris. The tutorial explains the process, the principles of design, and the elements the judges look for. These include balance, proportion, scale, rhythm, dominance, contrast, and unity. So “theme” wasn’t going to be my only problem. But at least I had enough background knowledge to begin designing. I had an old rusted metal gear and a spool of greasy wire. My new cake pan was just the right size for a container, so I sprayed it with rusting chemicals. Scrambling through my sword ferns, I recovered three moth-eaten walnut leaves still attached to stems, and a stick with some dead pepper tree leaves still on it. I had the foliage and container for my first arrangement. Now I needed a suitable iris. The only irises in bloom in the whole yard? A lacy orchid-pink Persian Berry and a dusky rose Lady Friend. Neither seemed suitable, name-wise, for the Industrial Revolution, but one would have to do. Orchid pink lace and rusty gears certainly do provide contrast, but the AIS design tutorial said not to overdo this element, so Lady Friend it was. I was in a bit of a spot for the Dark Ages Class. I had purged all purples and blues from my garden six years ago in a vain attempt to achieve some sort of color coordination. Fortunately, I had planted these irises in my neighbor's yard. I liberated one large, modern black iris and two Lent A. Williamson look-alikes. Thank goodness the rules in the Artistic Division allow unnamed cultivars and flowers that were not grown by the exhibitor. I was ready for the show. A Bevy of Bulbous Beauties! The bulbous members of the iris family are often overlooked, which is understandable given the cultural requirements of many of them. For the most part they require warm dry summer months and not every garden can furnish that. Here are a few I've grown in the PNW. 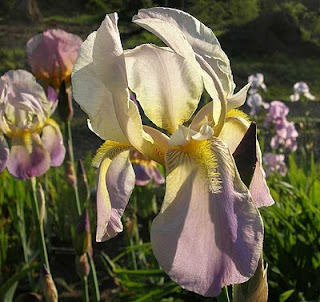 Iris danfordiae is native to southern Turkey and blooms early with the crocus. The flowers are small, in shades of deep yellow and are quite cheerful on our gloomy gray spring days. Unfortunately they do not persist for me and I have to replant every few years. 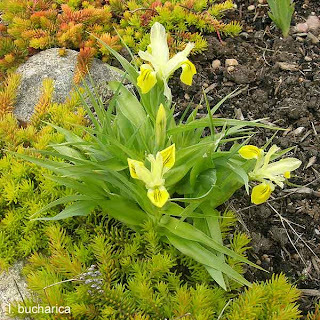 Iris bucharica is in the Juno family of irises and is a native of the Asian steppes. It has fleshy roots similar to a daylily that must be handled with extreme care, while the foliage habit looks very much like maize and the buds open at the leaf bases along the stalk just like ears of corn. This one loves our dry summers and well drained soil and does very well. It blooms along with the daffodils and adds yet another note of yellow to the garden. Dutch irises, members of the Xiphium family of irises, are natives of southern Europe and northern Africa. They are very popular in the floral industry, but not so much as a garden flower. Here they do wonderfully and the clumps get larger every year. They bloom with the early tall beardeds, come in a wide array of colors and make excellent cut flowers. 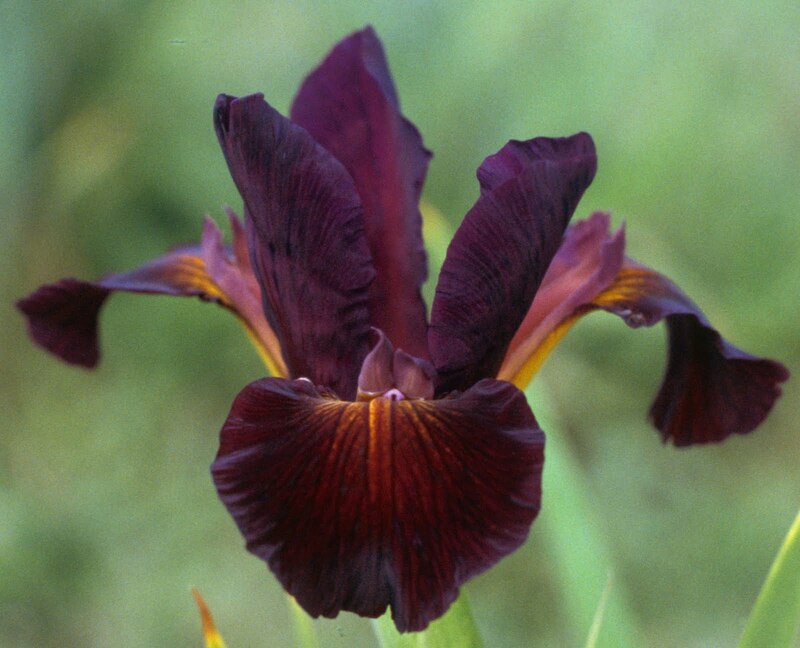 Last is another iris known by a designation that has nothing to do with its origins: the English iris. 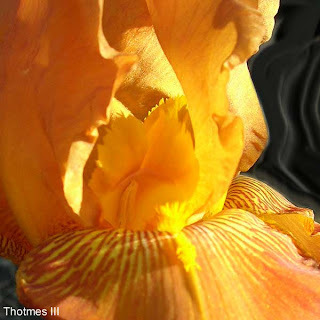 Related to the Dutch and Spanish irises, they are descendants of I. latifolium and native to France and Spain. They absolutely love the climate here and readily expand their clumps, blooming profusely along with the latest TBs and seeding about as well. The flowers on mine are pale lavender, but a deep navy blue seedling opened last year. I'd love to find more colors but have never seen them in commerce. 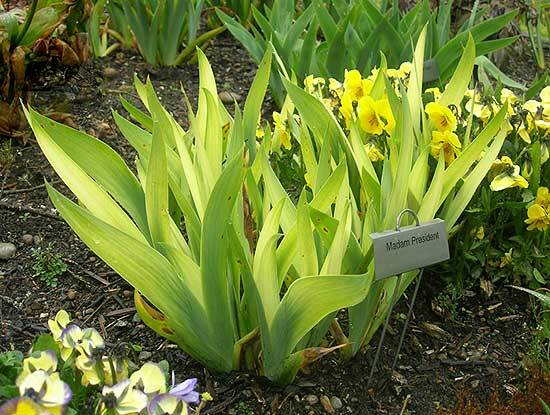 All these irises should be treated as other bulbs and allowed to go dormant for the summer months. With the exception of the English irises they are all easy to find at garden centers along with the other fall bulb offerings. Even if you can't grow them I hope you've enjoyed this peek into the wider world of irises. I wonder how many iris lovers even know what a spuria iris is. To go a little further, I am certain that very few people that profess to know what an iris is, have even heard the term spuria irises. 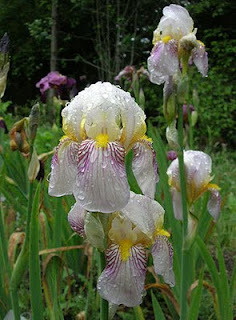 So I want to try to enlighten you, as iris lovers, about some of the truly wonderful traits of this family of irises. First, spurias look different than the bearded irises. They don't have beards. The tall stately foliage resembles cattails. Here comes the first wonderful trait, they don't go over in the wind. They are fantastic as cut flowers. When cut in bud stage, the florets will open in perfect sequence. In some parts of the US, florists are starting to use them in arrangements. The basic culture for spurias is dry ground or no wet feet except in rainy periods. Spurias will grow just about everywhere in the US. They will grow from the deep south to the farther reaches of Canada. They also will certainly grow on the west coast and east coast. 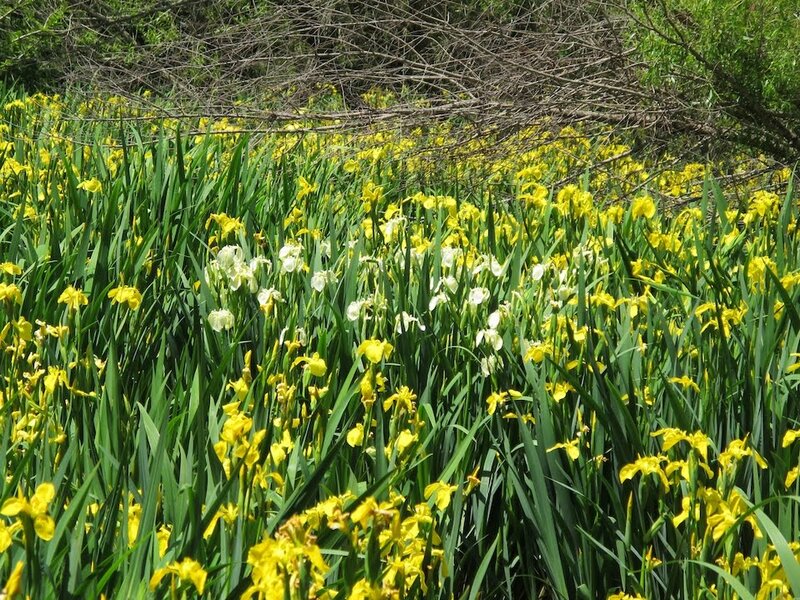 In the cooler climates they will bloom after the tall bearded irises. 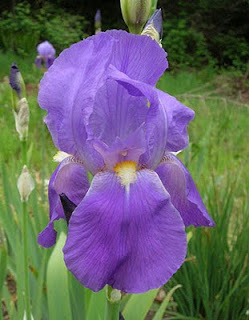 In the warmer states like southern Texas, Arizona, and California they will often bloom with the tall bearded irises. Spurias love fertilizer. The only blends that they don't like are very heavy nitrogen blends like lawn fertilizer. They love a dressing of well rotted manure. I shutter to think what will happen if that is tried on bearded irises. Now for the best culture topic of all. Spurias do not need to be split for years. Just leave them in place for 10, even 15 years. Take that, you tall bearded irises. Spurias are shipped or divided in the fall months. Cold climates should plant in August. Warmer climates will be shipped in September or even October. Spuria rhizomes should never dry out. Most shippers will place rhizomes in a moist paper towel and ship them in plastic baggies. If you are transplanting, put the plants in a bucket of water with a few inches of water in it until you can plant them. They should be planted as soon as possible. Landscapers are slowly discovering spurias, but the problem here, is just finding enought stock for large projects. There is not a better landscape iris on earth. Period. 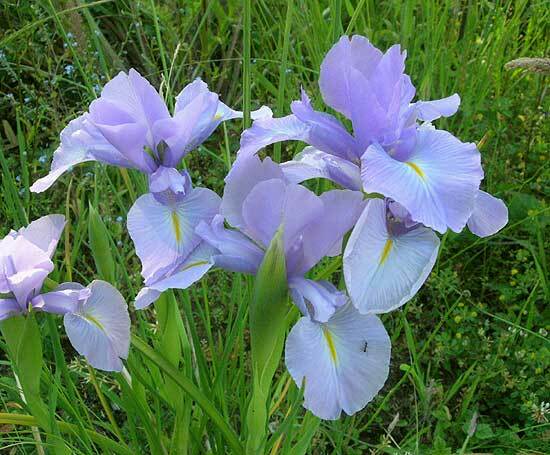 OK, I have told you about spuria irises. If you do not grow them at all, hurry you need to try some this year. If you have some now, you need more. Finally, please join the Spuria Iris Society to keep up with what's going on in the world of spurias. 'Wyomissing' (1909) Named for the town he helped found, this is a sweet flower with a lovely soft pink aspect. 'Rose Unique' (1910) A lovely small variety with lot's of rosy tones in the mix. Hardy and reliable of bloom. 'Juniata' (1909) A very tall pallida variety with a heavenly scent and a vigorous growth habit. Would be great for mass planting. has an excellent article on Mr. Farr by George H. Edmonds in the July 2010 issue. Check it out for more information on this pioneering American hybridizer. Nearly every iris we grow needs digging and dividing every few years. There are a few exceptions, siberians only need dividing if they slow in flower production, spurias almost never need division. There is one iris that is so good at self sowing it seems pointless to divide, Iris pseudacorus. Grown in poor dry soil it can behave like a dwarf iris and is shy to flower or set seed. However, if it is growing in moist soil it can be extremely vigorous and produce copious quantities of seed. When it is in its prime habitat of shallow water it becomes a thug. It can seed over an immense area crowding out nearly every other plant. 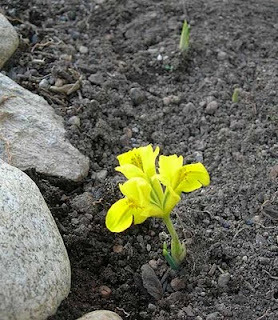 It is happy in anything from moist soil to nearly two feet deep in water. I foolishly planted a few select Iris pseudacorus in a pond about twenty years ago. A couple white flowered ones, a yellow with extra large flowers, and a giant form. I had previously planted a pseudacorus with variegated leaves that was eaten by muskrats. I assumed the green leaved forms might be just a tasty and did not actually expect them to survive predation by the pond's resident muskrat family. Not only did they survive they thrived. I suspect the muskrats are farming the Iris pseudacorus. The pond is a glorious sight in Spring covered in golden flowers with an occasional white flower still making an appearance. The sad part is, I was warned. 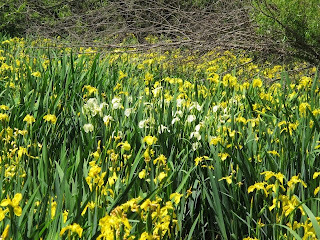 Nearly everything I had read cautioned against planting Iris pseudacorus near water. So, even if you have the knowledge it is worthless unless applied. 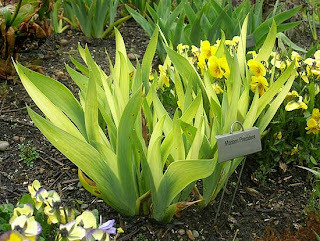 I do not want to discourage anyone from growing the cultivars of Iris pseudacorus in the garden as there are many wonderful selections available. There are also some really cool hybrids that do not set seed and would be perfect at the edge of a pond or lake. Spring is here, the iris fans are rising fast and blooms will be here before you know it. Time to get your camera ready for the 2011 AIS Photo Contest. Entries are being accepted from April 1 to June 30, 2011. This contest is free and open to everyone, with the exception of contest Judges and the contest chairperson who are not eligible to enter or win. The winning photo in each category will be published in the AIS January Bulletin and on the AIS web site. Prior year’s winners and honorable mentions can be viewed on the AIS web site at www.irises.org. The 2011 winner of each category will receive a 2011 Iris introduction. The winner of each category will also receive a single annual membership or membership extension to AIS. Winners who are AIS life members will receive an annual membership in an AIS Section of their choice. Runners-up of each category will receive a 2009-2010 introduction. I've been taking iris photos for years now and really enjoy it. I've learned alot thru trial and error - it really is the best teacher. Take as many photos as you can, which is easy now with digital cameras, varying your angle, distance and time of day. Avoid strong sunlight and distracting backgrounds. I most enjoy making use of morning and evening light. The sunshine streaming in from the side can make for luminous flowers, if not for accurate color representation. Here's a few of my favorite shots using the sunset for dramatic effect. For more information on taking great flower photos please visit these websites: Photographing Irises by Melanie North or Notes on Photographing Irises by me! Know of others? Please leave a link in the comments. For information about entering the AIS 2011 Photo Contest please visit the AIS Website. 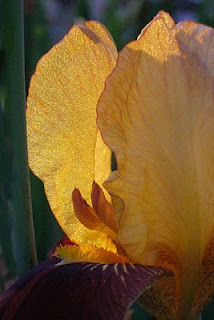 I look forward to seeing your winning photos in next January's issue of Irises!